Coffee should never be dull or bitter. Coffee should never be dull. No matter if it’s that first cup in the am or that delightful cup of joy in the pm, coffee should never be dull. Furthermore, one should not settle for bitter tasting java. All things rejectamenta should be avoided. Personally, I’m overjoyed to score a bucket of mud at the local McDonald’s. It has body, tastes great, and is inexpensive. By the way, I’m not knocking those that are willing to dish out 5 bucks for special mocha. Nothing wrong with that. Let the coffee wars begin! McDonald’s (NYSE:MCD) wants to add a little excitement to your morning with their brand of coffee. In fact, McDonald’s coffee is coming to a supermarket near you. McDonald’s has teamed up with Kraft to compete with the enemy, Starbucks Corporation (NASDAQ:SBUX). This could get interesting: Starbucks Pushes Further Into Grocery With Seattle’s Best. Kraft had previously teamed up with Starbucks, but Starbucks chose to end the partnership. Interesting. 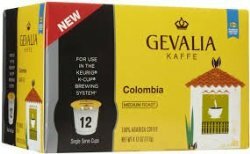 Just out of curiosity I thought I would try Gevalia Colombia . The cup of Gevalia Colombia was smooth, not bitter, and I enjoyed every drop of it this afternoon. Although it wasn’t necessary, I did add a bit of coffee creamer. Delicious I tell you. I urge you to try a new brand and find the coffee nirvana for yourself. Coffee should never be dull.